Eldorado Resort Casino Reno is a hotel and casino in Reno, Nevada, owned and operated by Eldorado Resorts. Don Carano opened the Eldorado in 1973 with 282 guest rooms, two restaurants and 10,000 square feet of gaming space with 200 slots and 12 table games. The Eldorado of 1973 included a lobby, registration area, coffee shop, cocktail lounge, specialty dinner house and gaming area. Also incorporated into the property were a convention room accommodating up to 600 people, a swimming pool and executive suites. In 1979, the success of the Eldorado Hotel Casino prompted what would be the first of many expansions and improvements. Guestrooms were brought to a total of 411 with a further expansion completed in September 1985 adding 20,000 square feet of gaming area and four new restaurants. By 1989 the Eldorado had grown to 817 hotel rooms and boasted its own on-site bakery, pasta and gelato shop and butcher shop. 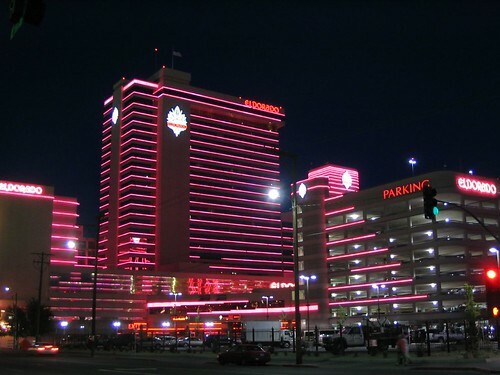 In 1992, the Eldorado added a 10 story parking garage for added convenience to guests. The completion of another dramatic transformation for the Eldorado happened in 1995. Coinciding with the construction of the Silver Legacy Resort Casino, a 50/50 joint venture between the Eldorado and MGM Mirage, the Eldorado added a crossover to the new downtown property connected by the first ever micro-brewery in a casino, The Brew Brothers. 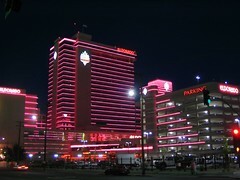 The exclusive Spa Tower was created, adding 10 floors of luxury accommodations; a 10,175 square foot convention center was opened as well as a 580 seat Broadway-style showroom. A coffee roasting company was added to the list of on-site services and the casino now totaled 76,500 square feet with more than 1,500 slot machines, 55 table games, a keno lounge, full service state-of-the-art race and sportsbook and poker room.